Today is the 49th anniversary of the Apollo 11 mission, humanity's first manned expedition to the moon. That is, if we ever made it there at all, of course. At the risk of getting punched by Buzz Aldrin, I've got to use this historic occasion to vent a bit about my skepticism. Now please realize, I'm not saying I necessarily don't have faith that we landed on the moon. I'm an Apollo agnostic, as it were. I'm a Skeptic, not a Denier. Communists had already realized attempting a violent overthrow of the world was impractical. The arms race was more of a stalemate that had to be kept up on both ends. How much good does "x times more overkill" really matter in a realistic sense. So you've got enough megatonnage to blow up the entire world more times, the minute you follow through what's the result? A world blown up several times over I'd suppose. Meanwhile, both the Soviets and the CIA had done their best to spirit away the brightest scientific minds of the Nazi war machine firing off an overarching science race. Equally important, however, is the Cultural Cold War. Academics like Frances Stonor Saunders have revealed the mystifying origins of American Expressionist art. The CIA, <a href="https://monthlyreview.org/1999/11/01/the-cia-and-the-cultural-cold-war-revisited/">through fronts like the Committee for Cultural Freedom (CCF)</a> and the Ford and Rockefeller Foundations basically propped up artists like Jackson Pollock, as well as certain literary and art journals, museums and cultural critics who made sure these artists were lauded. That's right, Jackson Pollock's genius ability to drip paint may only be famous because of a group of spooks and elitist billionaires thought it was the best way to win the "Cultural Cold War." American Exceptionalism and Culture have been the primary exports of the US since WWII. Apart, that is, from war, arms and civil unrest of course. To clarify, I am using the term "Culture" in the loosest sense of the word. Primarily the "culture" that the US exports consist of Hollywood movies, i.e. trash popular culture. Speaking of Hollywood, as far as Apollo Skepticism goes, you can't delve too deeply into Revisionist Lunar History without running into the theory that Stanley Kubrick was commissioned by the government to fake the moon landing. Just one year short of the decade anniversary of Apollo 11 the film Capricorn One was released making the theory of a faked space mission mainstream. Many conspiracy theorists flock to Kubrick like moths to a flame. There are the theories that he (and Mozart, or so I've heard) was actually assassinated by the cabal that rules the world for revealing the truth in a work of fiction. Eyes Wide Shut for Kubrick, Die Zauberflöte/The Magic Flute in the case of Amadeus. I don't necessarily doubt the moon landing. I just don't necessarily have <i>faith</i> in it either. I know, I know, this makes me halfway to flat earth theory in many people's eyes. I don't disbelieve the moon landing because of Capricorn One or The Shining and 2001: A Space Oddysey. When I was younger, the main issue for me was the idea of this lunar module coated in a thin layer of aluminum foil flying through he Van Allen radiation belt. The Van Allen belt contains a swathe of electromagnetic frequencies <a href="http://curious-droid.com/182/apollo-deal-van-allen-radiation-belts/">including microwaves and I know good and well, you can't put aluminum foil through a microwave!</a> Speaking of foil, I won't don the aluminum deflector beanie, but the precise coordinates of the landing and how they line up with Masonic numerology inspired a cocked eyebrow more than once as well. 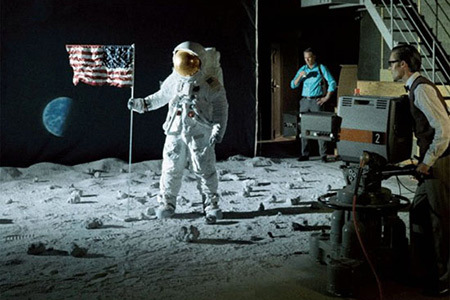 Now of course, <a href="https://spacecentre.co.uk/blog-post/know-moon-landing-really-happened/">scientists have got plenty of explanations for this</a>. I think I read somewhere that the radio waves that were emitted by the NASA rocket converted the radiation ahead. Ok, sure, IANAP (I am not a physicist) and I failed the first six weeks of Advanced Placement Physics so badly I was dropped into "Family Dynamics" (Home Ec without the sewing). That said, I know that over the last five and a half decades the "official story" of the JFK assassination continually changed. I also know that it's <a href="https://docs.google.com/spreadsheets/d/1FmXudDf6pqisxq_mepIC6iuG47RkDskPDWzQ9L7Lykw/edit#gid=1">statistically unlikely</a> that all of the people who died within years of the assassination who were connected to it in some way, were researching it or had some insider information died without some "external aid." If someone was responsible for this statistically significant rise in unnatural deaths, couldn't the same sorts of people be involved in misleading, buying off or even assassinating scientists? Whoops, I did say I wasn't going to delve into tin foil hat territory here. Forget I said anything about that. Nearly 55 years ago the government told us that Lee Harvey Oswald was a lone gunman who acted solely on his own and put forth a "magic bullet" theory. In the 90's before Gerald Ford died he <a href="https://www.nytimes.com/1997/07/03/us/ford-made-key-change-in-kennedy-death-report.html">admitted the "magic bullet" theory was falsified</a>. In the intervening years more and more information has come to light proving that our government lied to us. In the past decade alone both the FBI and CIA have admitted complicity in obscuring certain facts of the matter. You know what another word for that is? When a group of people works together to illegally manipulate world affairs? It's technically called a conspiracy. But hey, to be fair, it was the Cold War. We couldn't admit that we either let the President get got or were in some way complicit or at least duplicitous in the matter. And that's just my point. If we've been lied to about inhumane, covert experimentation on civilians and the assassination of a beloved president what else would they lie about? Or perhaps more to the point, what <i>wouldn't</i> they lie to us about. "humanity's first and only manned expedition to the moon." Some one has not even bothered to check the Wiki. Even ignoring Apollo 8, 10 and 13 that "only" went to Lunar orbit and back there was Apollo 12 and 14 through 17 that all had manned landings. If you are going to claim "skepticism" and don´t even know that then i suggest having some skepticism to your own skepticism. I'd like to know how they lost the technology to get back there, assuming they got there in the first place. one wonders how long it will be before someone in government finally tells the people the truth about 9/11. arabs with box-cutters it was not. The "Moon" is a jewish hoax. Wake up sheeple you are educated stupid.